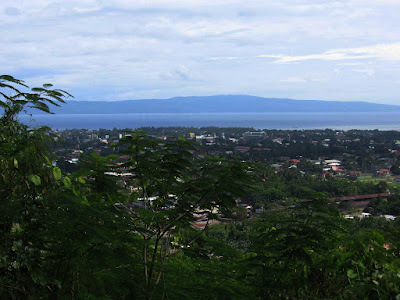 You are seeing the Gulf of Davao, from Catalina Gardens in Shrine Hills, this city. 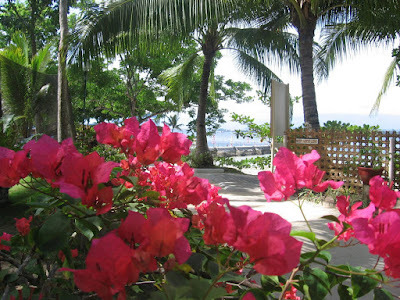 Bougainvilleas bloom at Paradise Island Resort, Island Garden City of Samal. 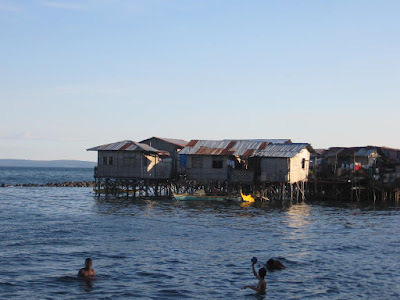 I took this picture some months back, this area used to be a beautiful garden of the Maryknoll House in Sasa this city, but as of today I am not sure if this still exist, capitalist has been grading this area for a jetty of a resort across Island Garden City of Samal. A classic example of ‘pains of development’. I took this at Eden Nature Park when we had our family outing the other week. If you want some place peaceful and quite to clear your mind, meditate, or commune with nature at its most natural setting then this place is just right. On a clear, sunny day you can actually see the whole of Davao City from these iron chairs. 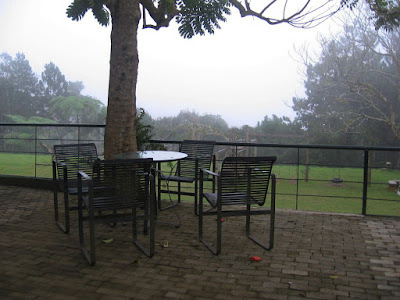 Misty dusk at Eden when this photo was taken. 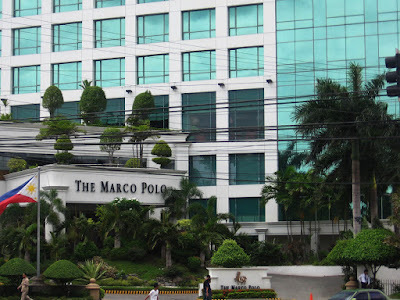 The Marco Polo Hotel Davao along CM Recto St., Davao City. 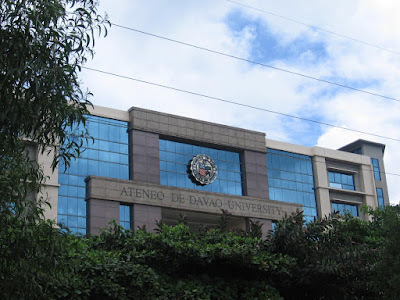 Davao City's premier university. 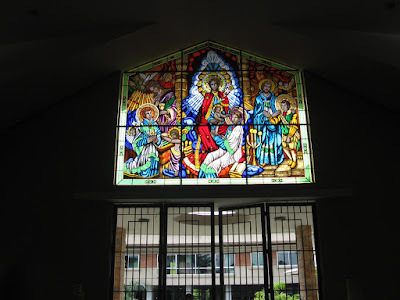 ATENEO DE DAVAO UNIVERSITY. To know more about this university visit their site here. 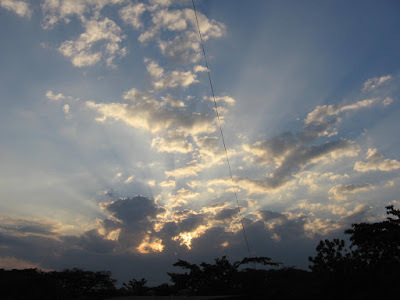 Call it lucky that every time I scale up the stairs to my class at the fourth floor of Assumption College of Davao, at 5:30 in the afternoon the sky always put on a show. 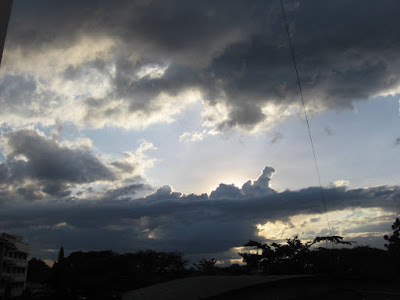 This is a three-day series shot of the sky taken from the stair balcony. Note the wire that crosses signifying that this photo is taken on the same location. 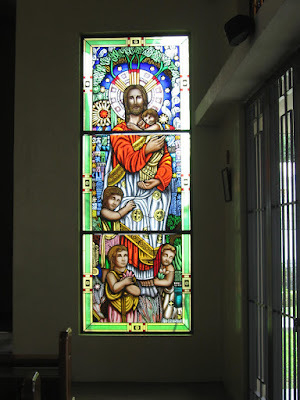 A country that ranks 12th in the most populous city of the world with an estimated 97,976,603 people according to World Population Clock, with 26 births/1000 people, with only 5 deaths/1000 people, where 80% is Catholic and abortion is utterly illegal, where budget to health services is the world’s worst according to IBON Foundation … still refuse to go along with any strategy to reduce, or even just slow down if not to halt human production. Maybe because all the good lands were all occupied by those who ‘have’ and those who ‘have nots’ just simply occupy the lands under water and build a house on stilts. 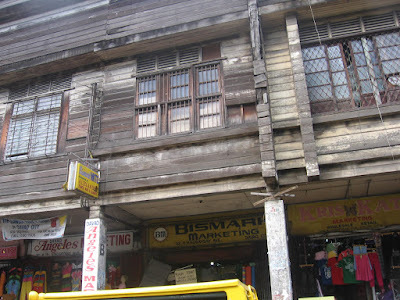 Stilt houses built just across Magsaysay Park here in Davao City. 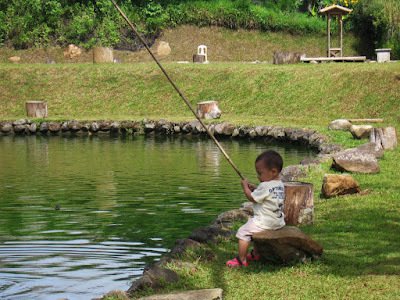 This little boy is turning two today, hopeful to catch a fish for dinner tonight! Happy Birthday my son, Angelo! 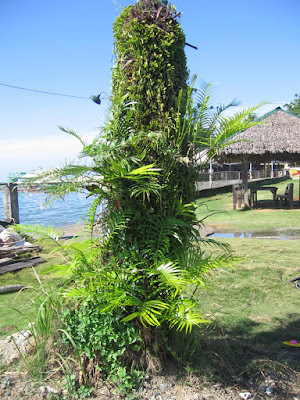 Shot at Eden Nature Park, Fishing Village. They are gypsies from Samal Island selling pearl stuff knocking motorists’ window on a red light. I see it a dangerous enterprise since they bring along with them little children for added sympathy to buy their stuff. The city government has programs for them but others really can’t help it but wander on the streets and solicit easy cash from motorists. Out of boredom listening to a bragging politician last night, I played around my seat with my camera. 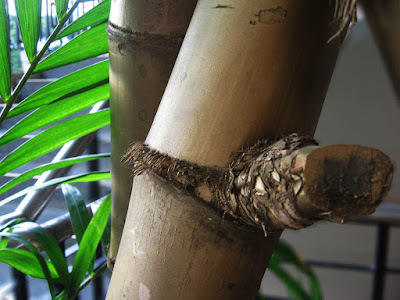 I spotted this gold-painted bamboo decor right beside me and freeze-up this bamboo node. 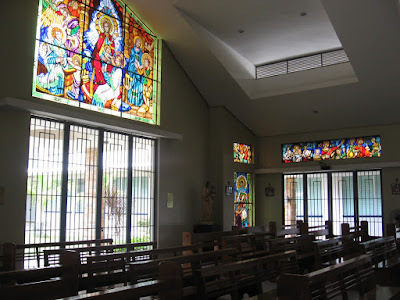 I love this little chapel of St. Stanislaus Kostka inside Ateneo de Davao University Matina, so I drop by the other day to take some photos of the inside. 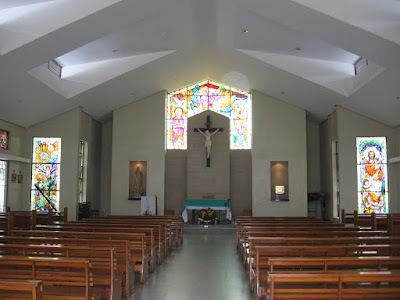 My January 8 post featured the chapel from the outside. 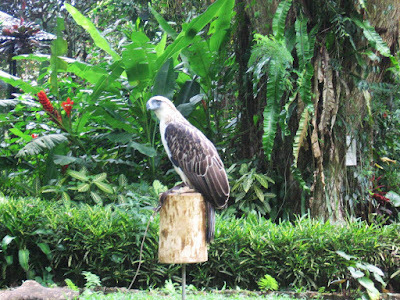 This is SIR ARNY, one of the Philippine Eagles (Pithecophaga jefferyi) held captive and conserved at the Philippine Eagle Center in Malagos, Calinan, he was hatched on February 4, 2002 and was adopted by NOVARTIS Animal Health Sector. Unfortunately he has not found his mate yet and according to the experts at the center, he has not manifested any indications that he will be allowed to be freed to the forests. 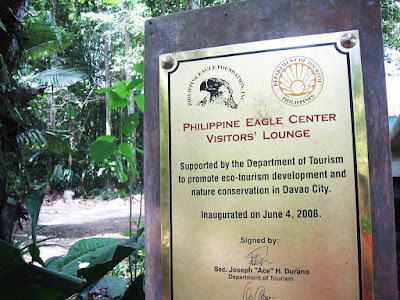 This post is dedicated to my virtual friend Arvin U. de la Pena of Written Feelings who likes eagles because according to him, even if they have the same feathers they don’t fly together, (and eagles are very territorial too) not like other birds of the same feather that they fly together, in the same manner corrupt people fly together. Indeed! Arvin, you poked it right on the spot. 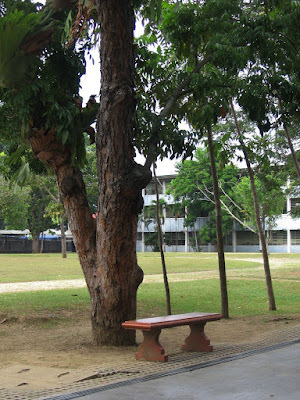 One of the benches alongside the soccer field of Ateneo de Davao University Matina Campus. 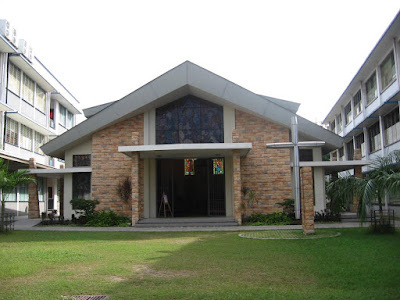 Ateneo de Davao University Matina Campus. 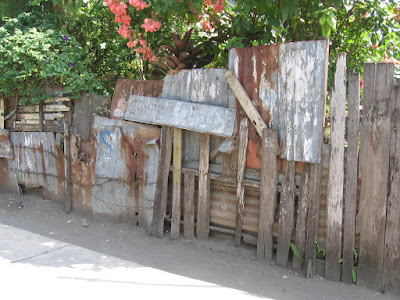 Throughout the history of humankind, many great nations and empires sought to erect fences and barricades of different kinds all to achieve certain strategic objectives. And those were not just mere structures that regulate entries and exits, but walls, fences or barriers that carry a great deal of symbolism. 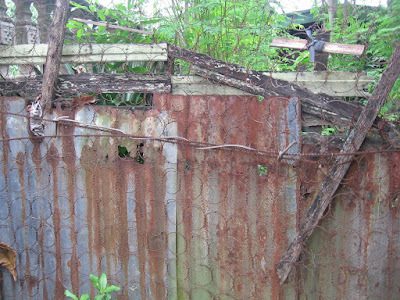 The Berlin Wall, the Great Wall of China, the Perimeter Fence that divides US and Mexico, Israel’s security fence, the fence that was built by the Soviets and East Germans to block out the West and then became a symbol of the Cold War … and the list goes on of the many political angles of fence. 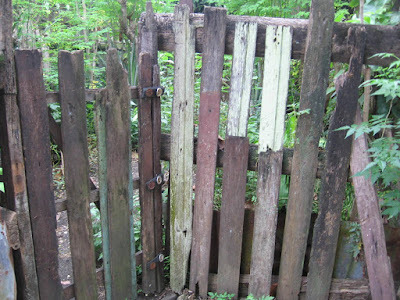 Those mentioned were great, strong fences that made history, what about these? 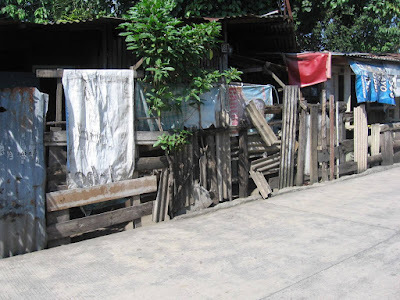 Do these fences represent also strong political echo of the lives of common pinoys (Juan) in this part of the country? I really think so! 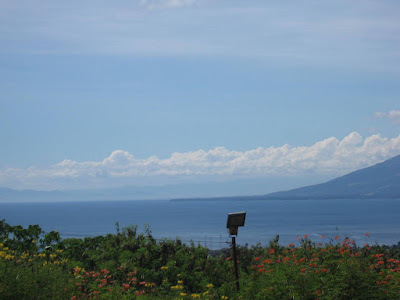 Cloud-capped Mount Apo on a bright sunny day from Catalina Gardens at Shrine Hills. Mt. 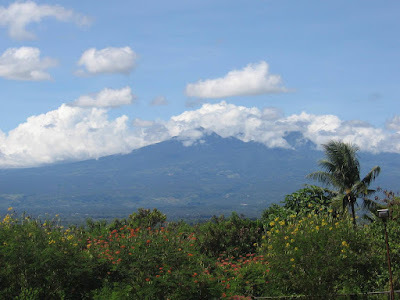 Apo is a large solfataric potentially active stratovolcano on the island of Mindanao in the Philippines. 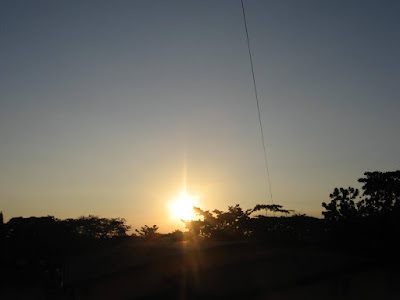 It is the highest mountain in the country and overlooks Davao City-40km northeast, where I live, Digos City-25km southeast, and Kidapawan City-20km west. Its name means "master" or "grandfather". Mount Apo is one of the most popular climbing destinations in the Philippines, and the summit is easy to reach. The first recorded climb was on October 10, 1880 by a party led by Don Joaquin Rajal. 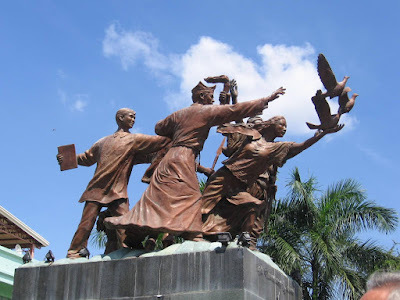 The monument of Peace and Unity. This centennial monument of unity and peace is dedicated to the people of Davao. The different natives or lumads of Davao. 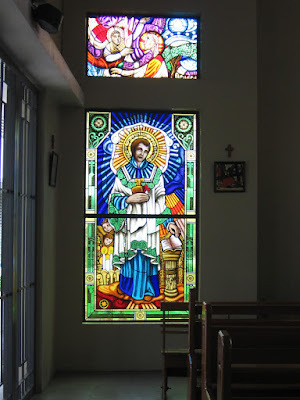 The Muslim who came and settled along Davao’s coast and the Christians led by Don Jose Oyanguren who came in 1848 to establish the first Christians settlement here. 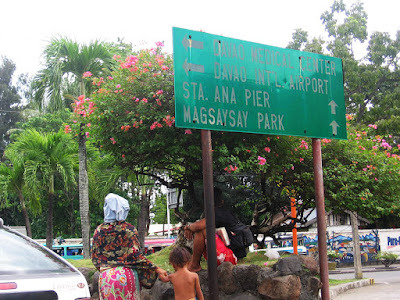 They, people of diverse cultures and from different places who came and lived together as one, made Davao what it is today. 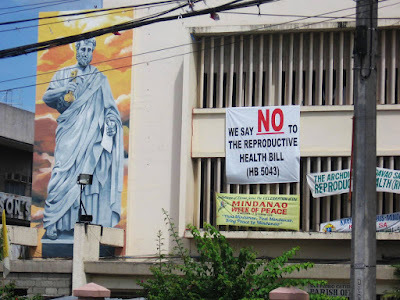 We their descendants, beneficiaries and present Davaoenos honor them for their legacy of unity and peace…. Their most valuable legacy to us. So goes the text on the marker of this monument. This was unveiled on June 12, 1998 in celebration of the centennial year (1898-1992), this is artfully mounted at the frontage of the Sanguniang Panlungsod building along San Pedro St.
Again, my heartfelt New Year’s greetings to all my visitors may this year be a blessing, peace and joyful filled blogging year for all of us. Our journey might be unique from each other, our destination might be different from each other, some future might be certain and others uncertain, what matters is how we live life along the journey. 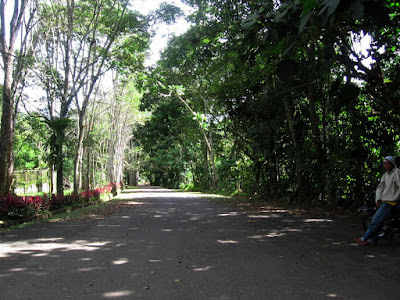 A road leading to Philippine Eagle Center in Malagos, Calinan, Davao City.